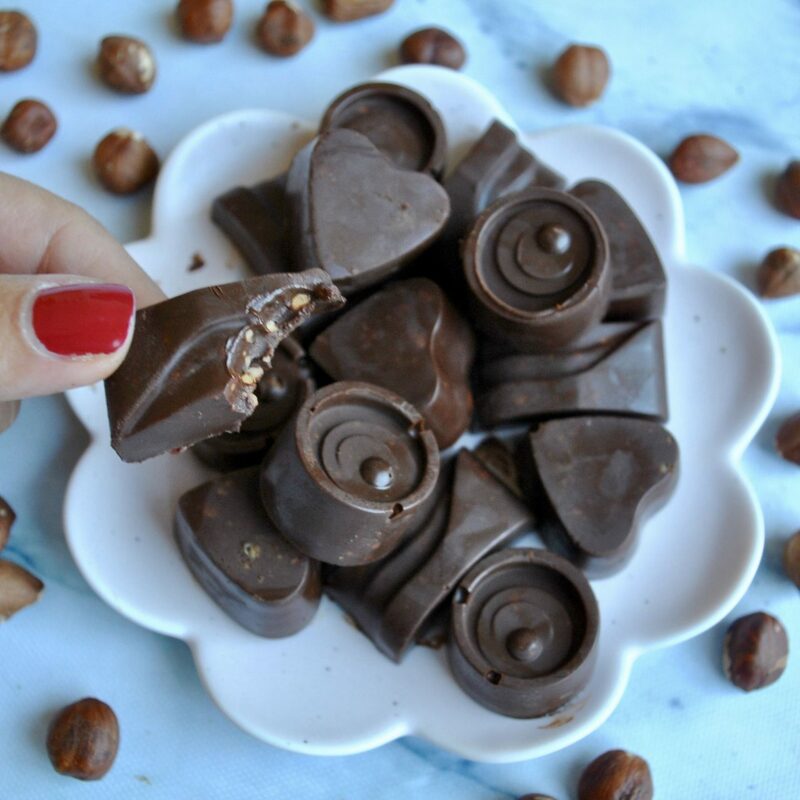 If you’re a Nutella-straight-from-the-jar type of person, or a fan of the chocolate-hazelnut combination in general (everyone loves Ferrero Rochers), then this recipe is for you! 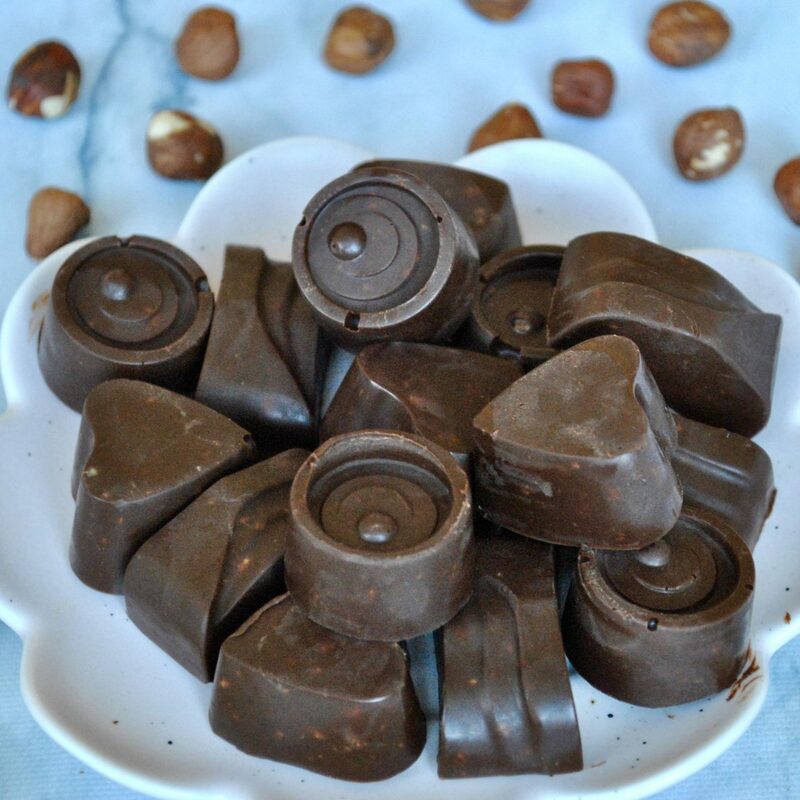 Despite naming them Nutella Truffles, which admittedly sounds ultra decadent, if you’ve read my blog you won’t be surprised to hear that they’re entirely dairy-free, gluten-free and vegan, as well as free from refined sugar depending on which chocolate you use. 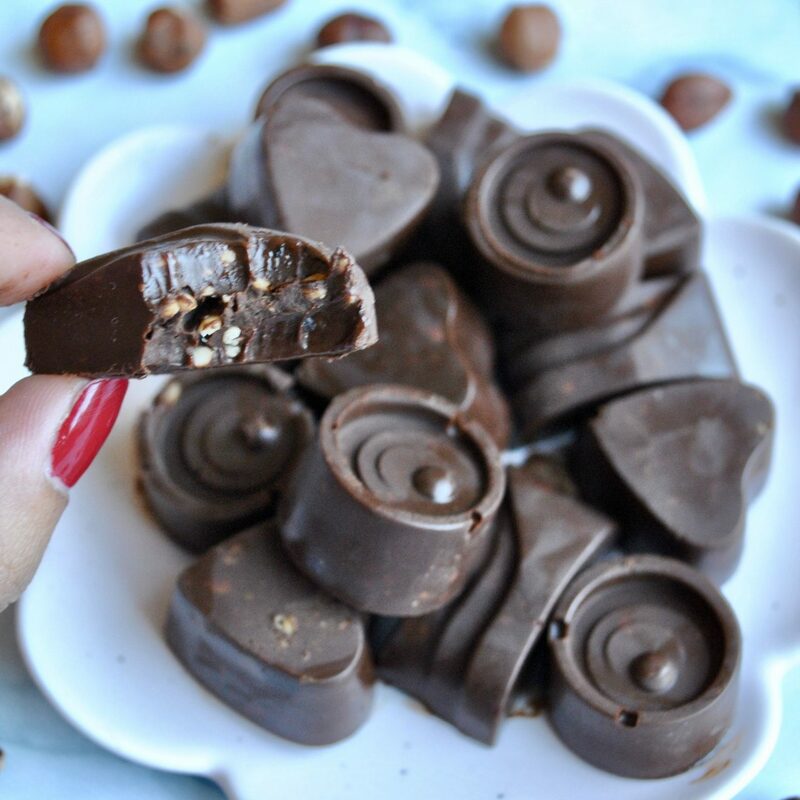 They’re made with only 3 ingredients, and if you’ve got chocolate moulds at home then you’re all set! Don’t worry if not – feel free to use cupcake liners, or even a plate lined with greaseproof paper. I love storing these Nutella Truffles in the freezer to make them a bit more firm and chewy, but they’re equally delicious when stored in the fridge and will remain soft enough to literally melt in your mouth! 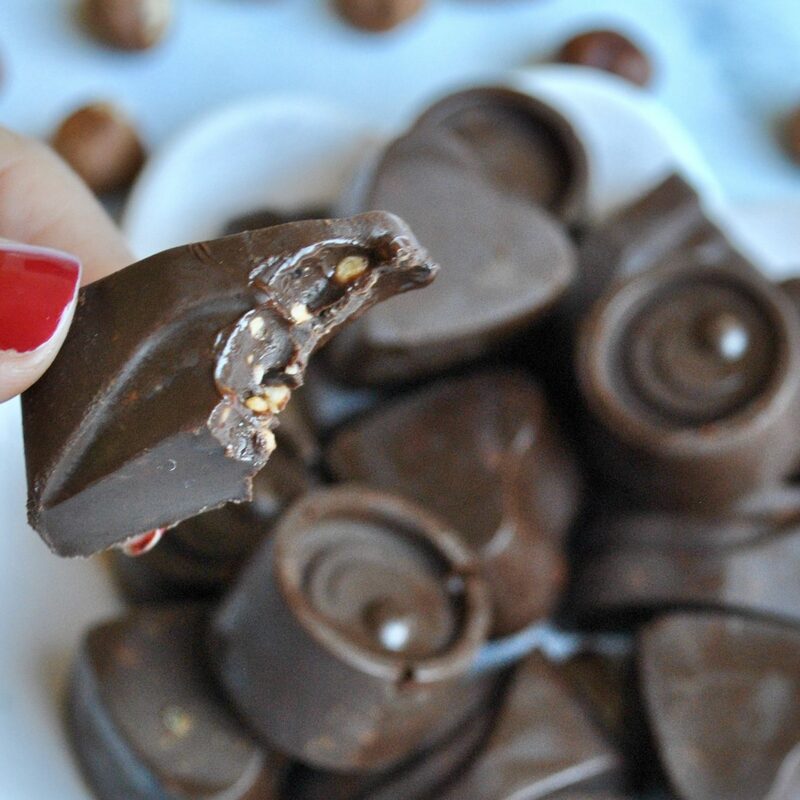 The chopped hazelnuts pack in another crunchy layer of texture to the rich dark chocolates – and the best part is that you can make them from scratch in less than 30 minutes! What are you waiting for? Melt the chocolate on a very low heat, stirring regularly – either in a bowl over a pan of hot water on the stove, or in the microwave. 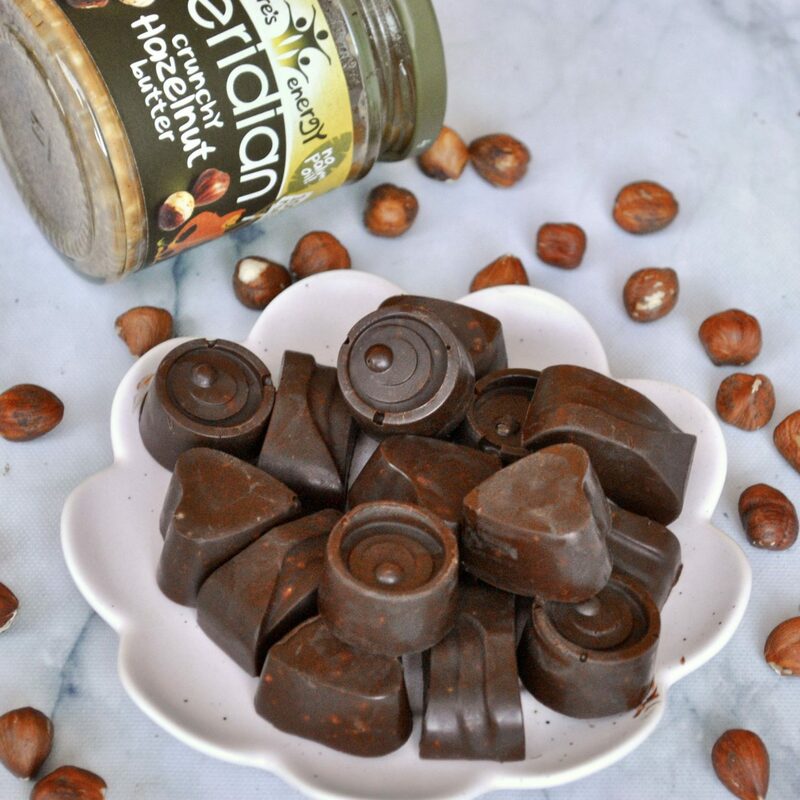 When almost entirely melted, stir in the nut butter and continue to melt together until completely smooth and combined. Fold in the chopped hazelnuts and salt. 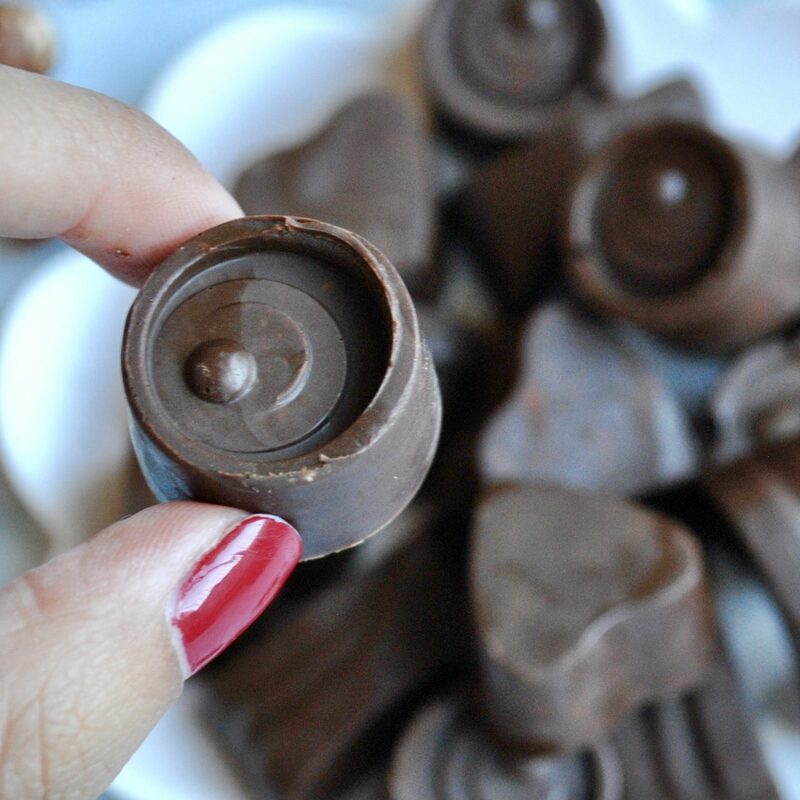 Fill each chocolate mould to the top or place 1-2 tablespoons into cupcake liners. Place in the freezer for 20 minutes until firm. Store in the fridge for up to 1 week or in the freezer for up to 3 months. 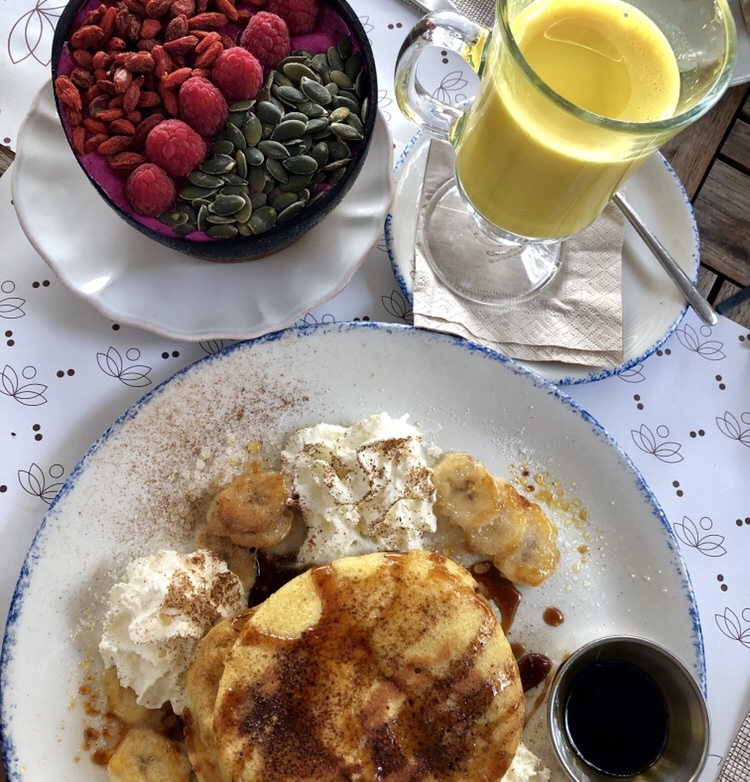 On a recent trip to Marbella in the southern Spain, I was lucky enough to spend a few days exploring the health food scene in this sun-drenched hotspot. When you think of Spanish food, the first thing to spring to mind is probably paella, so I was blown away by the extensive selection of healthy eateries offering gluten-free and dairy-free options, as well as a vast array of vegan dishes. 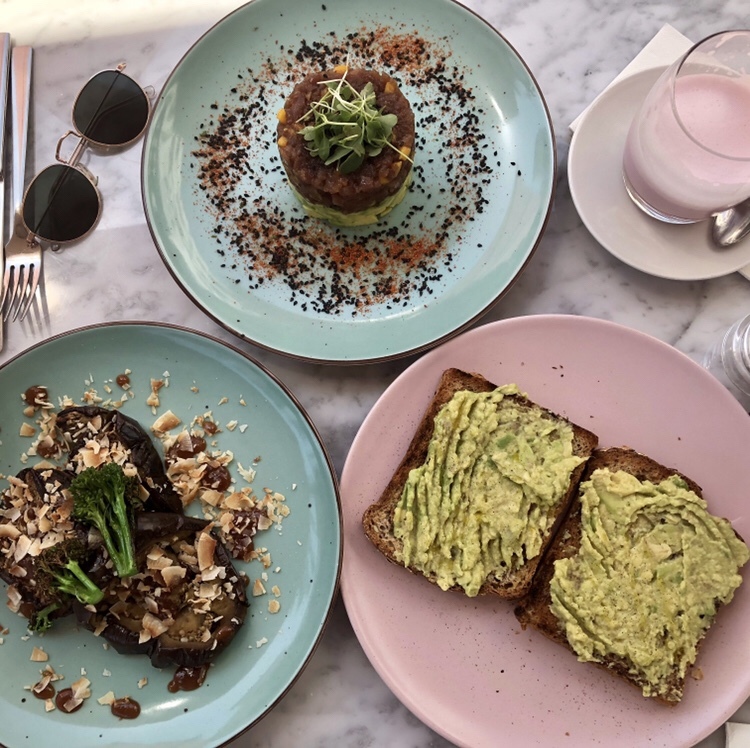 I’m here to give you the lowdown on my 5 favourite brunch spots, so be sure to add these to your list if you’re planning a trip anytime soon! 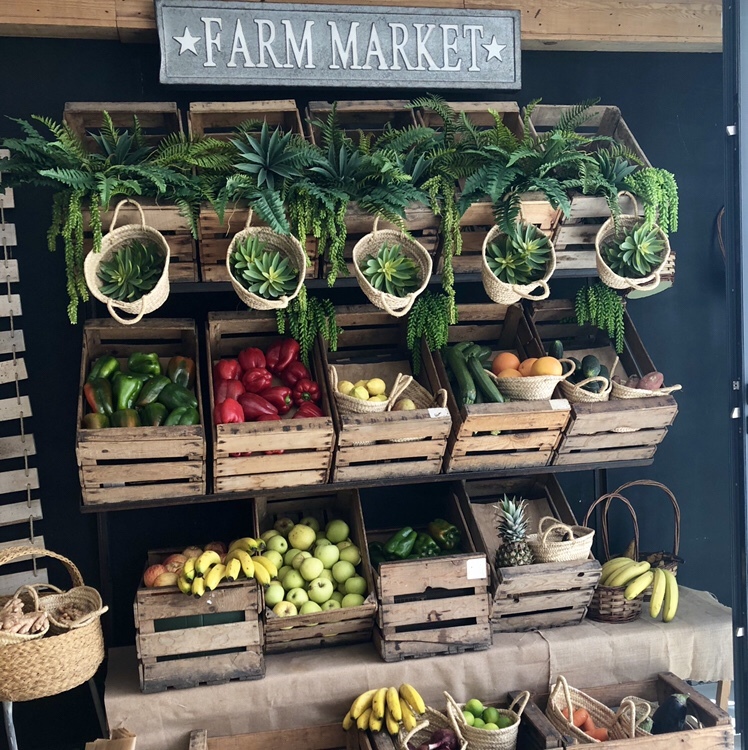 Situated across the road from The Marbella Club Hotel, Organic Market opened in 2014 and has already established itself as one of the prime spots in Marbella for organic healthy food. The menu ranges from creative raw vegan dishes to fish and chicken, so it truly caters for everyone. The food is served on wooden chopping boards to enhance the rustic feel of the place, while the shop inside sells all kinds of superfoods and healthy products. From the moment you walk into this stunning cafe, you’ll be blown away by the two giant flower walls, the swing bench and the beautiful interiors. 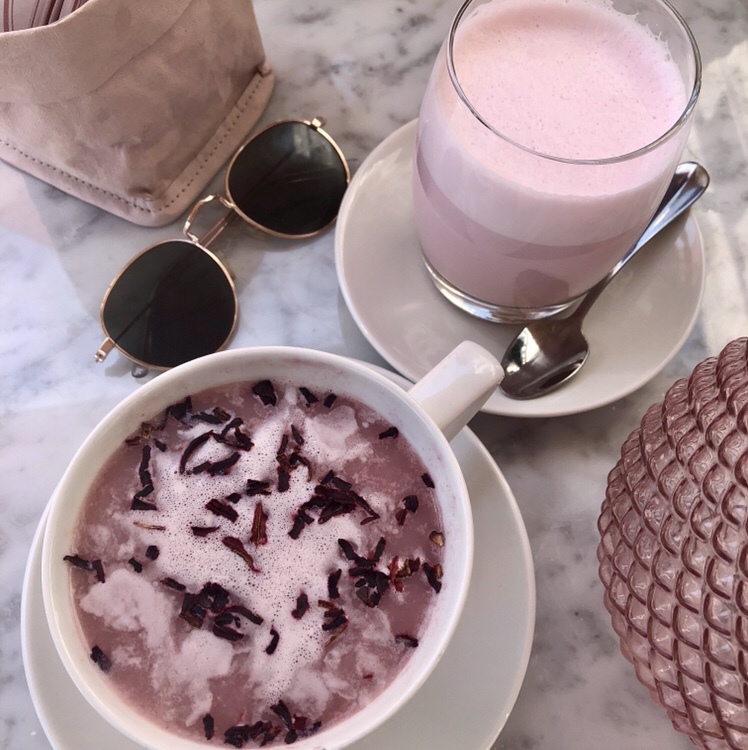 Set in the heart of Puerto Banus, be sure to check it out – for the colourful lattes, healthy organic food, phenomenal waffles and indulgent desserts! Celicioso started off as a gluten-free bakery and has expanded its menu to offer a huge range of food all day long. 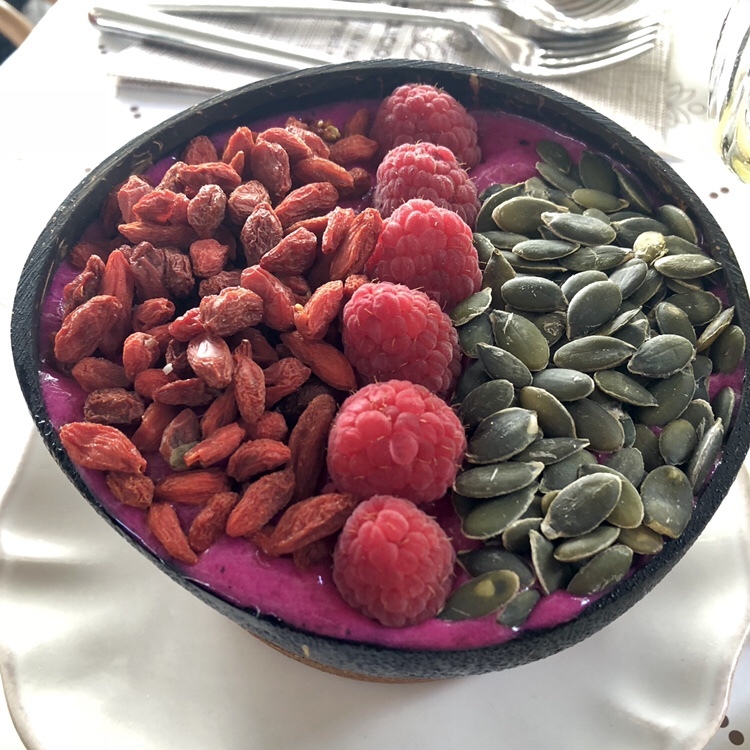 Their build-your-own smoothie bowls offer an exciting twist to the standard açai bowl and the fluffy banana pancakes with vegan salted caramel sauce are exceptional! This restaurant is “flexitarian”, meaning that their menu is primarily plant-based but they still offer meat and fish, so you can bring along the whole family! They avoid refined sugars and chemicals and place an emphasis on fresh wholesome ingredients. Their breakfast menu ranges from paleo hash browns made from sweet potato, to homemade crunchy granola with passion fruit coulis and coconut yoghurt. There are two locations in Marbella but I prefer the one right by the beach so you can see and hear the waves crashing as you sip your superfood smoothie. Located by the gorgeous Puente Romano Hotel’s outdoor swimming pool, the setting is enough to lure you in. Pop in for brunch – avocado rye toast, smoothie bowls and savoury crepes – or go for dinner and order the falafel wrap, aubergine with yoghurt or even a hamburger. They also have a second location in El Corte Ingles shopping centre in Puerto Banus. 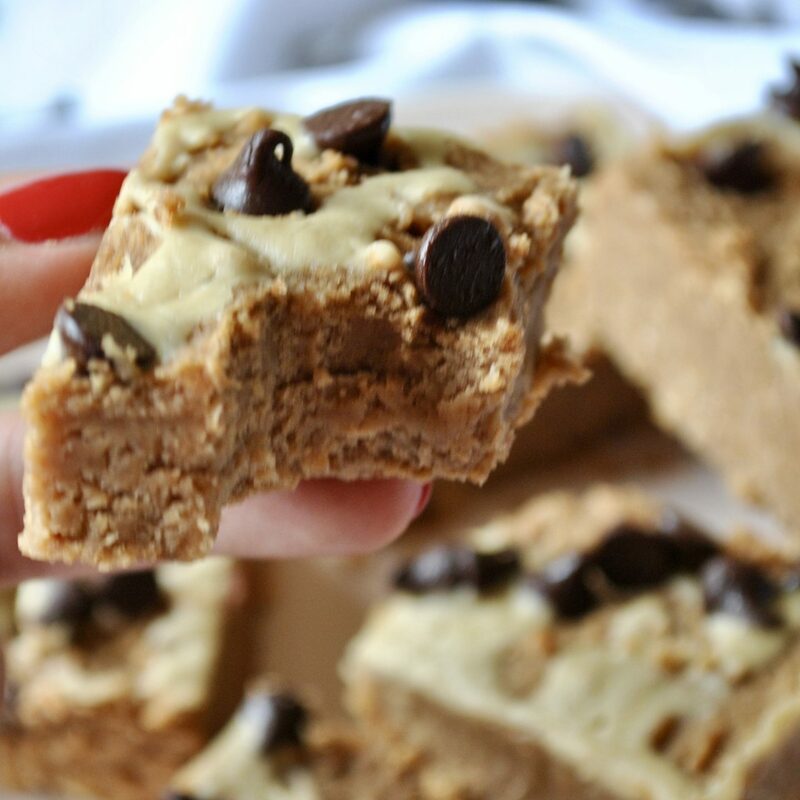 Allow me to introduce you to the fudgiest blondies you will ever sink your teeth into! Made with a top secret ingredient (scroll down for the big reveal! ), these have a slightly gooey consistency and are loaded with chunks of dark chocolate. 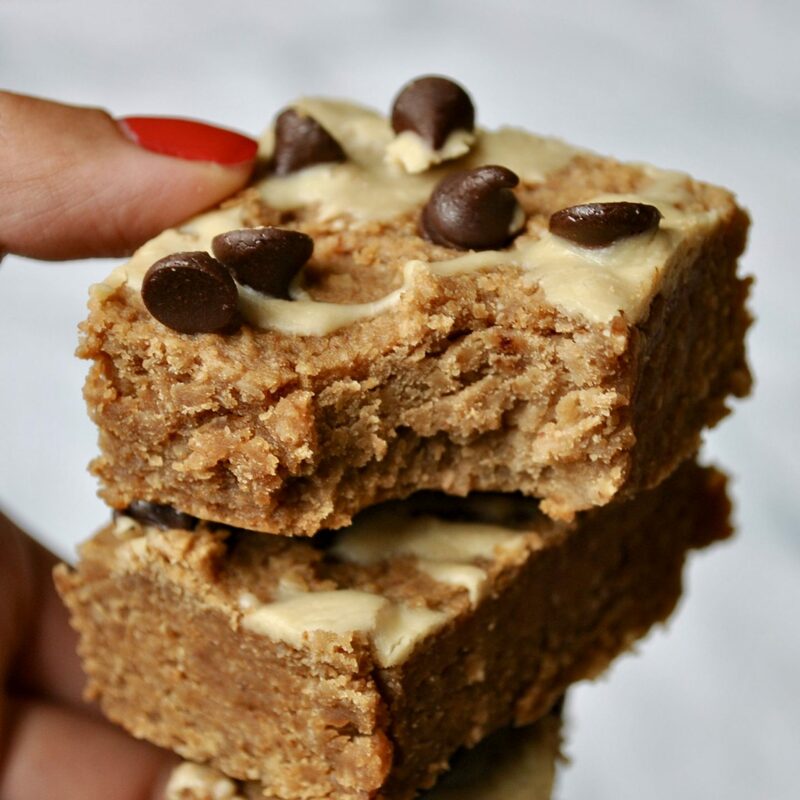 These are completely flourless, suitable for vegans and free from gluten, dairy and refined sugar – so anyone and everyone can enjoy them with pleasure! 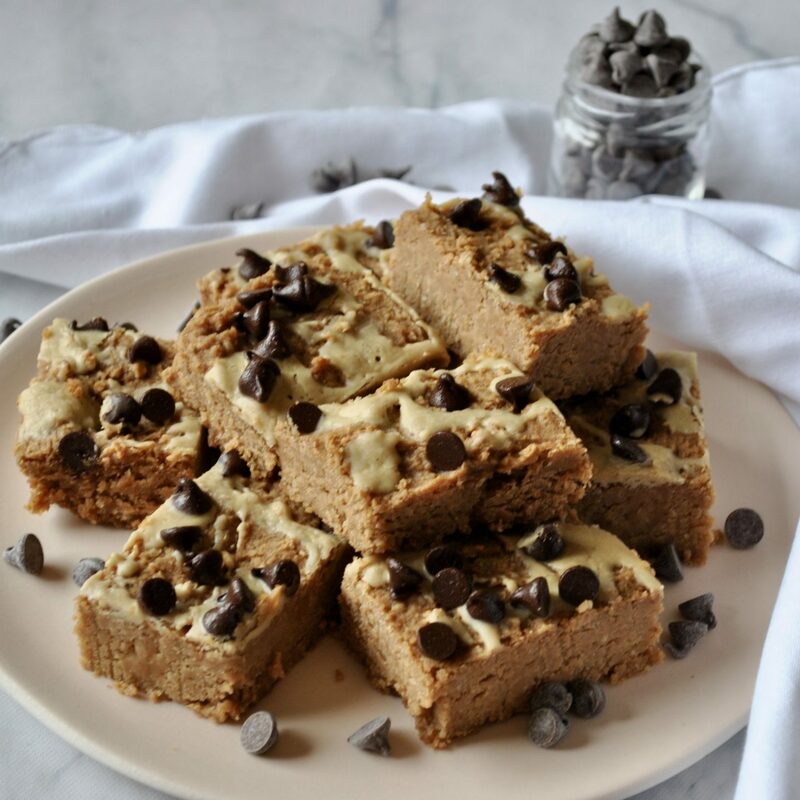 All you need to do is chuck all the ingredients into the food processor and whizz together until a thick cookie dough-like batter forms. Feel free to taste the delicious raw batter – remember it’s totally vegan (no eggs/dairy) so no risk of food poisoning either! 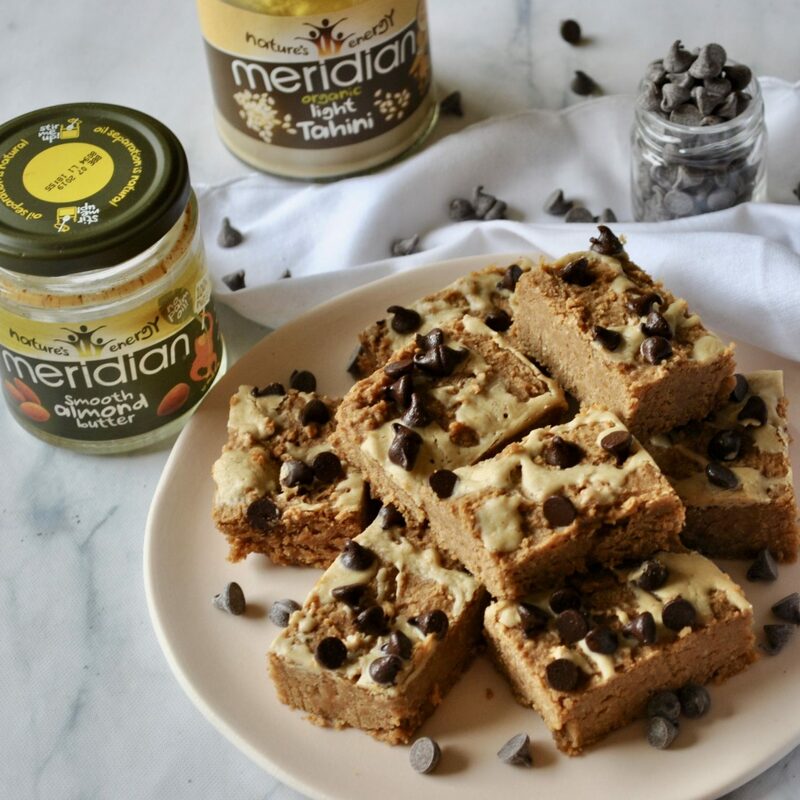 I love adding tahini to desserts – it’s not just for hummus! I find it adds another depth of flavour and a creamy texture, which goes even further whether combined with a couple of spoonfuls of silky coconut oil! I use a variety of natural sweeteners, include my favourite coconut sugar – but you could easily swap this for regular brown sugar if that’s all you’ve got at home. Preheat oven to 180 C and line an 8×8 pan with greaseproof paper. Drain the butterbeans and rinse well under cold water. Add all ingredients, except the dark chocolate and half the tahini, to a strong food processor, and blend together until a smooth mixture forms (you may need to stop and scrape down the sides a couple of times). Stir in the chopped chunks of chocolate by hand, and transfer the mixture to the greased pan. 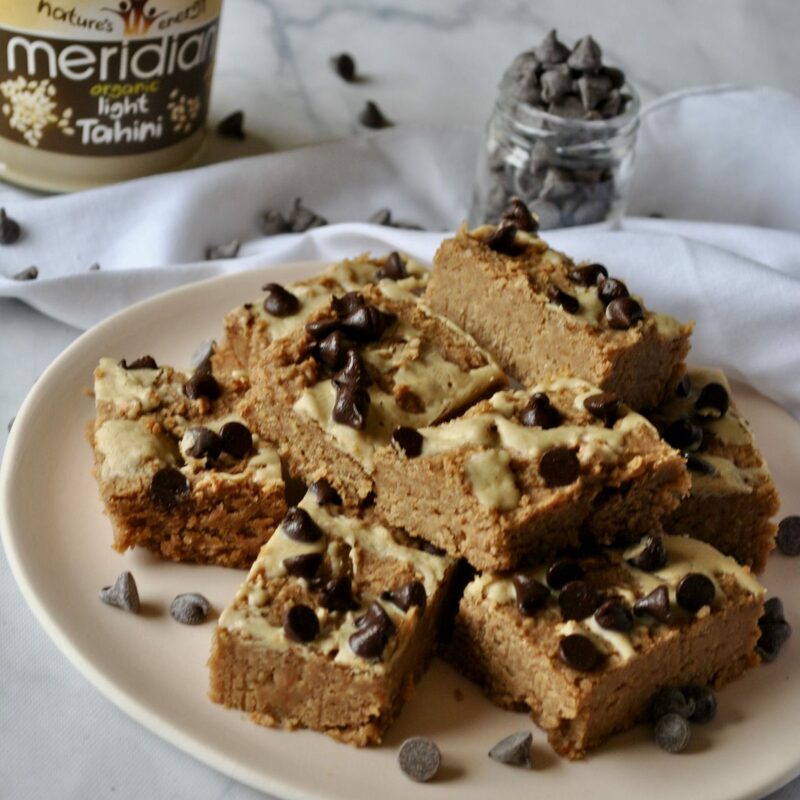 Swirl the rest of the tahini over the top of the mixture using a spoon, and feel free to add a few chocolate chips on top for decoration! Bake for 12-14 minutes, then allow to cool for 15 minutes before placing in the freezer for half an hour to make them firm and chewy. Finally, transfer to the fridge, where they can be kept for up to 5 days. Waffles are my absolute favourite weekend breakfast. There is nothing better than getting up a bit later than normal, putting on a pot of coffee and hearing the waffle iron sizzling away in the corner of the kitchen! I’ve recently started experimenting with gluten free baking and I’ve found gluten free flour to be quite a challenge to work with, but these waffles made with gluten free self-raising flour (Doves Farm) worked a treat. Better still, the chocolate and chai spices work really well with my favourite breakfast topping of all – chocolate peanut butter! Preheat your waffle iron and prepare according to model instructions – you may need to grease it with a small amount of vegan butter or coconut oil if your waffles tend to stick. Stir in water and mix well using a wooden spoon. When your waffle iron is up to temperature, spoon 2 tbsp of mixture into each waffle mould and cook for 3-4 minutes. Remove from the waffle iron and repeat until you have used all the mixture – mine made 8 small waffles. 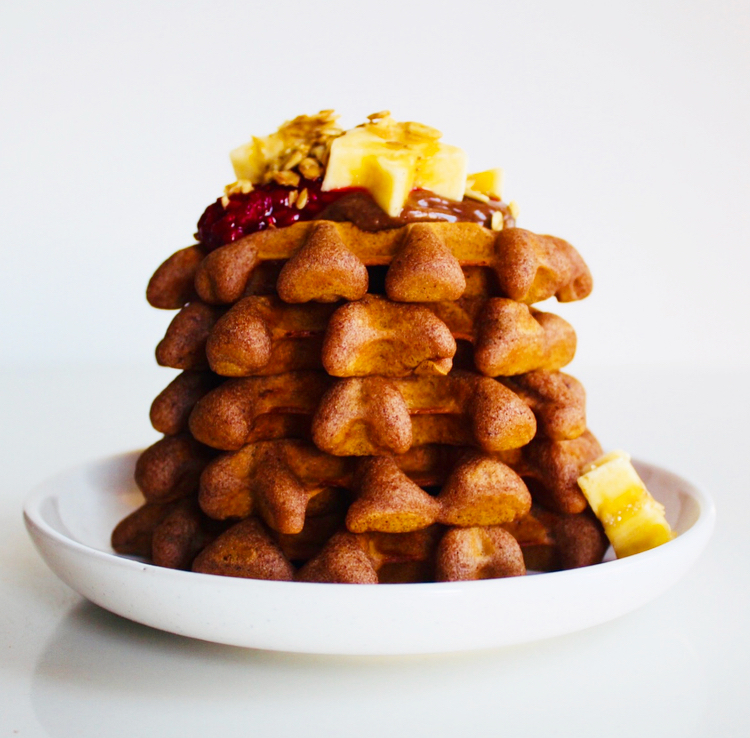 Stack the waffles on a small plate and top with anything you fancy! I used chocolate peanut butter, stewed raspberries, banana stars and gluten free granola. Try making your own toppings such as this Almond Butter Coconut Granola, this Nutty Cinnamon Granola, and a spoonful of homemade Raspberry Chia Jam. 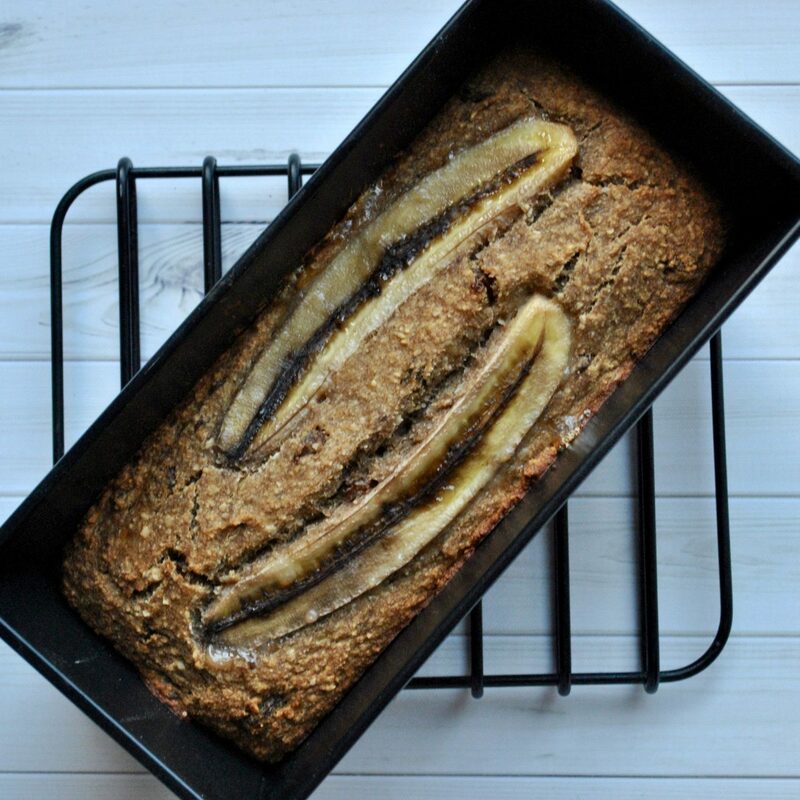 My name is Romy and I am honoured to share one of my favourite vegan breakfast recipes with you! Since starting my blog in 2015, I have been working to prove that going vegan doesn’t mean you’re missing out on anything. I decided to live the plant-based life in 2014 and I have since been showing that balance is key and that everything is possible on a vegan diet! One of my favourite recipes to create are definitely divine breakfasts. I love a long Sunday brunch with friends and family – and as an early bird I love getting into the kitchen in the AM to create something super tasty. I believe it’s the best way to start the day, and it’s also themotivation I need to get out of bed. 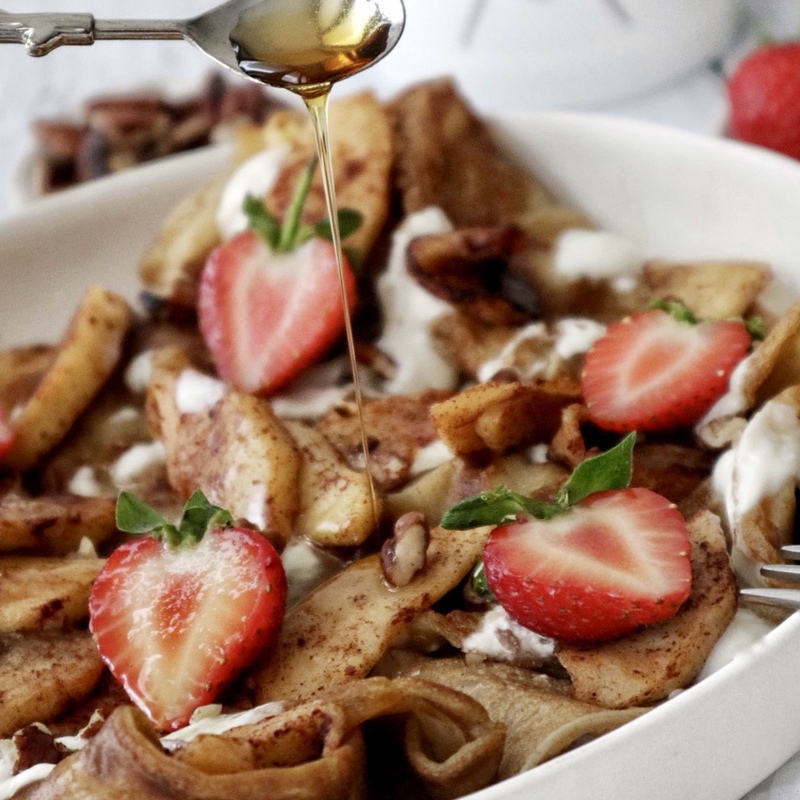 However, my real dilemma is deciding whether I enjoy pancakes or crepes more – because that’s truly the kind of question I would not know how to answer, and let’s hope that I will never have to make such a decision! 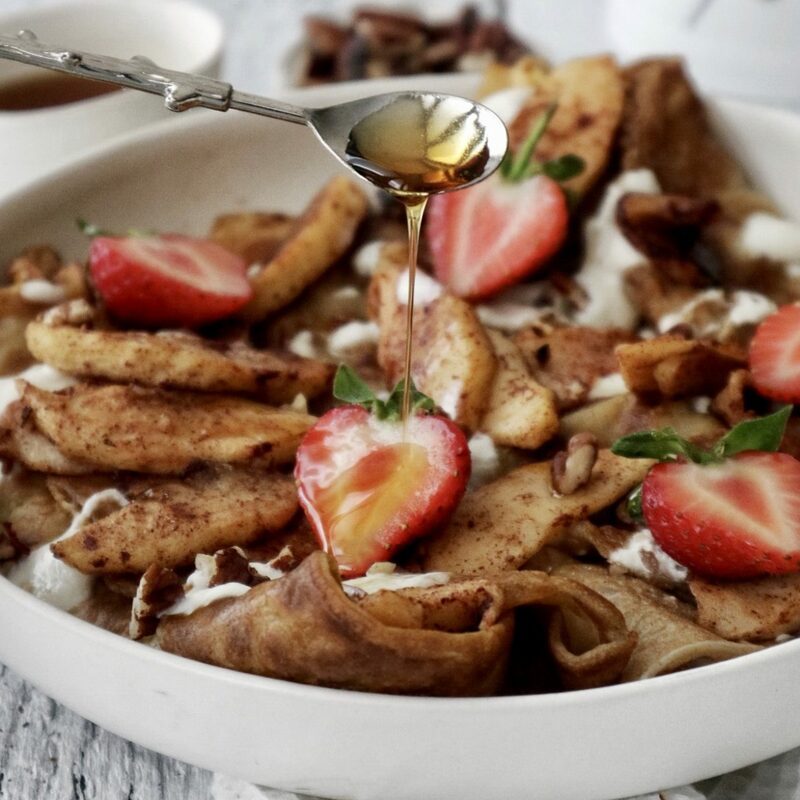 As apple & cinnamon have always been one of my favourite flavour combinations – and crepes are generally easier to stuff with apples than pancakes are, I decided to share this recipe with you, so you can get your Sunday #brunchgoals going as well! Start by sifting your oat flour – it’s important that it’s fine, with no big chunks, so that your batter mixes smoothly. In a large bowl combine the sugar, baking soda, oat flour and flax seeds. In a separate bowl combine all your wet ingredients: almond milk, water, vanilla extract and lemon juice. Set aside for 10 minutes. In the meantime heat a large pan over medium heat and add a little coconut oil to the pan. Ensure that the pan is well coated in the oil – I usually use a paper towel to coat the pan in the liquid oil, of course make sure the pan is not too hot yet. When your pan is hot, use a ladle to transfer a ¾ loading of the batter into the pan. Pour out the batter in the centre of the pan and let the batter naturally distribute. Wiggle the pan once to get rid of any air bubbles, then leave the crepes alone to firm up. 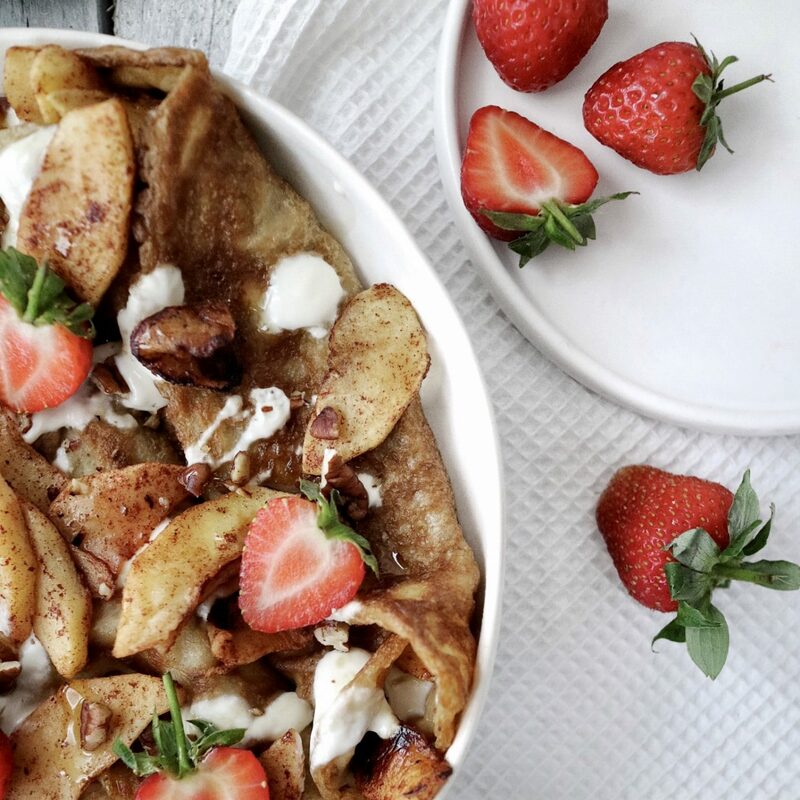 Ideally leave the pan between low and medium heat – if the pan is too hot, your crepes will become crispy (If that’s what you’re after, go ahead and give it some heat of course). Flip the crepes once the top of it is firming up, the crepes should not have any liquid batter anymore before you gently flip it. When both sides of your crepes are golden brown, it’s ready to leave the pan. Make sure to stay by the pan at all times to not burn your crepes. Repeat until all the batter is used up. 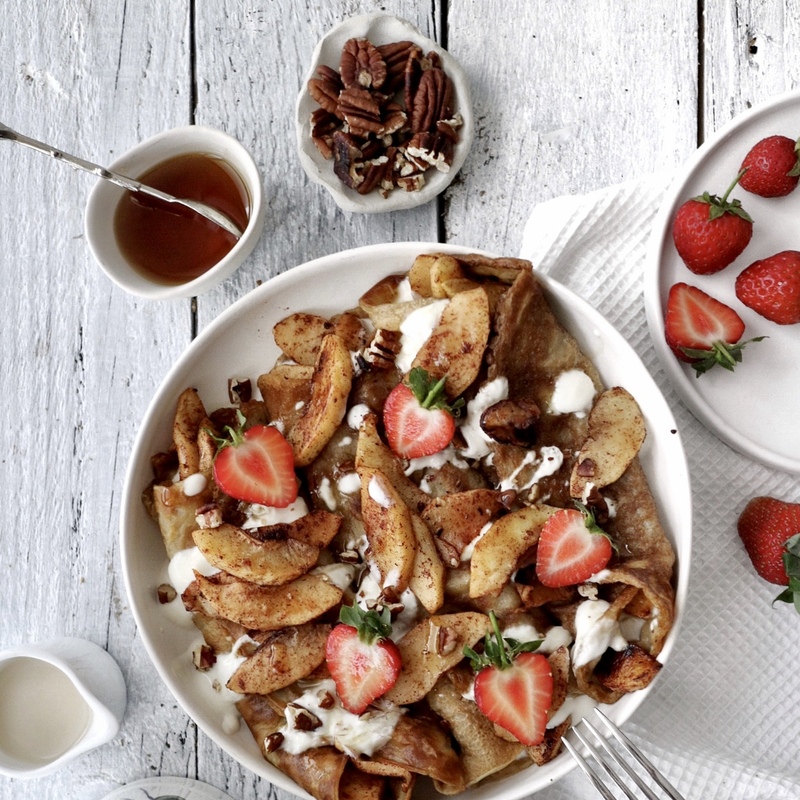 To keep the crepes warm, you can add them to an oven-proof plate and set them in your oven at around 50 C.
Whilst you’re making the crepes, start on the filling by washing & peeling your apples, then cutting them into thin slices. Place them in a pre-heated medium size pan together with a little coconut oil and sprinkle the cinnamon on top. 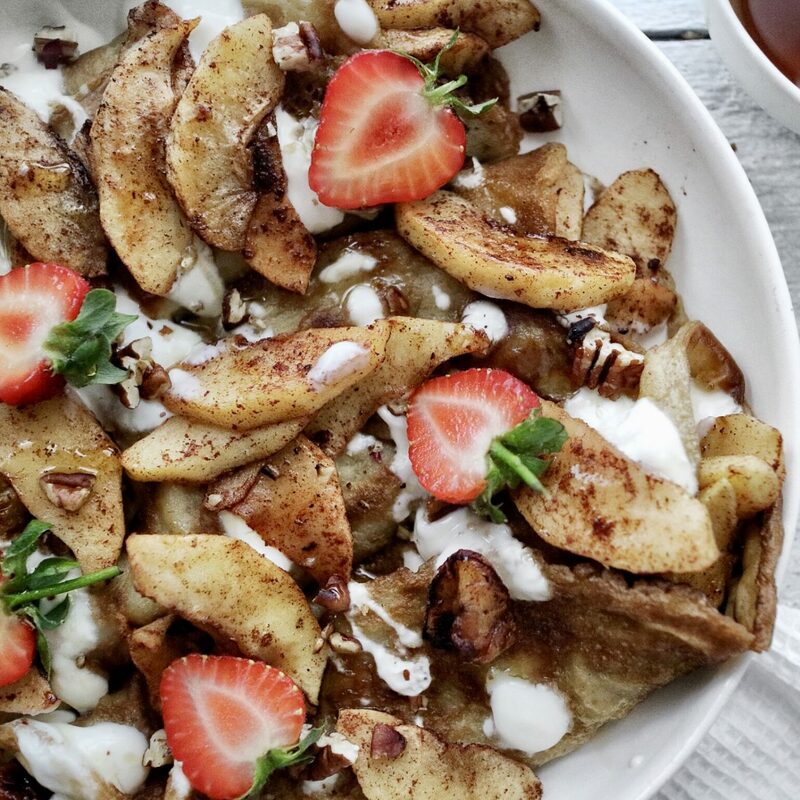 Gently cook the apples on medium heat until they become soft, then drizzle in half of the maple syrup. In a separate pan toast the pecans, if they’re not toasted yet, then set aside. 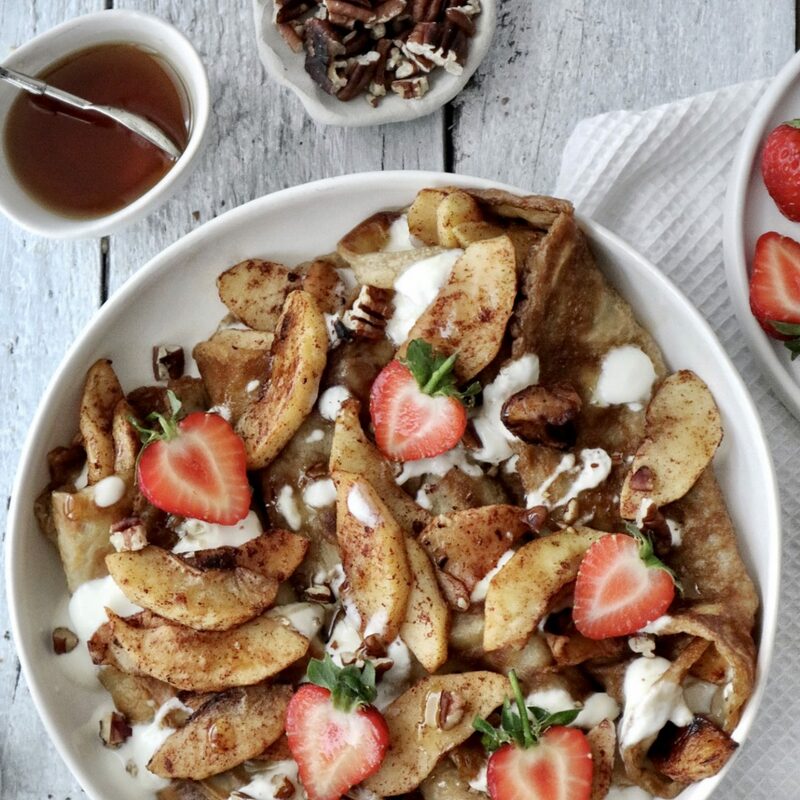 Assemble your crepes by adding 1-2 tbsp of the apple mixture to each crepes, then adding a dollop of coconut yogurt and close the crepes. Finish off by drizzling the remaining maple syrup on top & sprinkling the toasted pecans. Decorate with fresh strawberries (optional) and you’re ready to go! Enjoy & share with your favourite people! 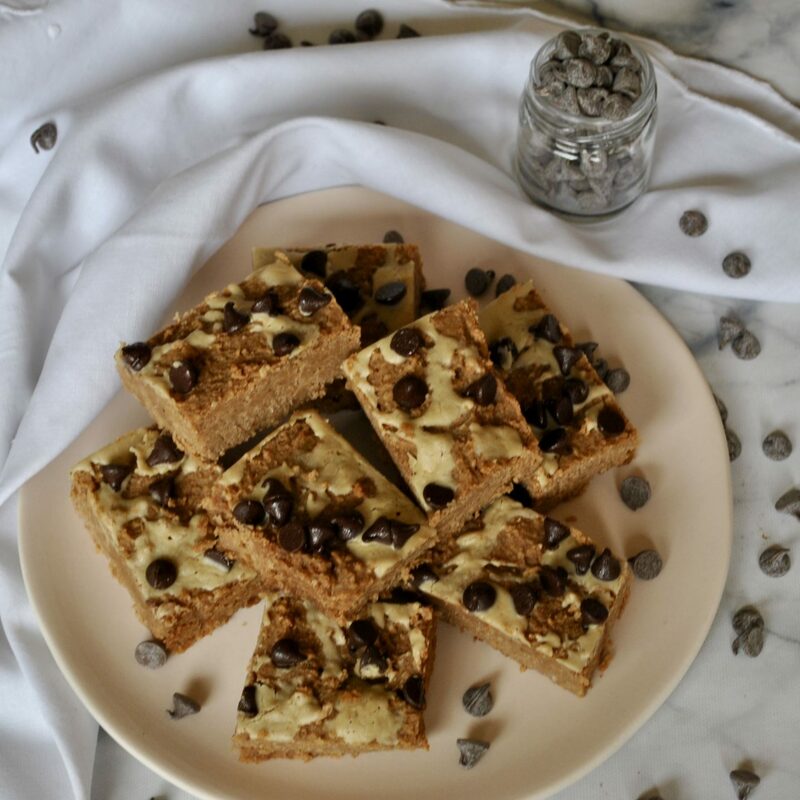 Thank you so much to Romy for sharing her delicious recipe on my blog today! Make sure to check out her blog here. I’d love to see if you make these so be sure to tag me on Instagram @cerealandpeanutbutter !